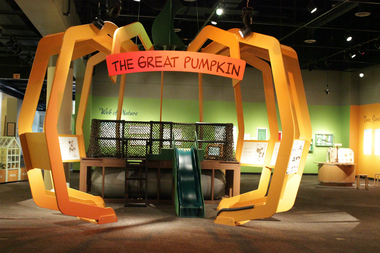 Kids can roam around the Great Pumpkin structure at the exhibit. LINCOLN PARK — The man behind Snoopy, Charlie Brown and the rest of the Peanuts gang cared about the natural world around him. Fans of Charles M. Schulz and his iconic comic strip can learn more at "Peanuts ... Naturally," an exhibit that recently landed at Peggy Notebaert Nature Museum, 2430 N. Cannon Drive, ahead of "The Peanuts Movie," which will debut Nov. 6. Schulz "was a conscientious and thoughtful guy. This is not something that just happened to be in his scripts. This is something he intentionally put in because he wanted people to care about nature," said Steve Sullivan, the museum's senior curator. At the exhibit, museum-goers can check out blown up strips dating to the 1950s where Charlie Brown and the gang tackle a number of natural subjects like the solar eclipse, recycling and conserving energy, to name a few. There are also a few interactive stations, a collection of bird nests a la Woodstock and a giant structure made to look like the Great Pumpkin for kids to roam around in. One of the highlights: environmental posters Schulz made in the 1970s with slogans like "Polluted snowflakes!" and "I believe in conserving energy!" "Back in the 1970s, we were literally taking our toxic waste and shooting it into the ocean. As a society, we were ecological ignoramuses. Charles Schulz was ahead of this time," Sullivan said. The traveling exhibit comes from the Charles M. Schulz Museum in Santa Rosa, Calif. It's free with museum admission.